In an exchange on Twitter the other day with the marvellous actor James A. 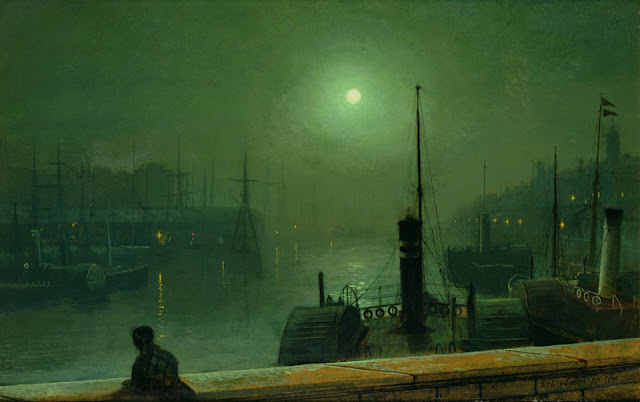 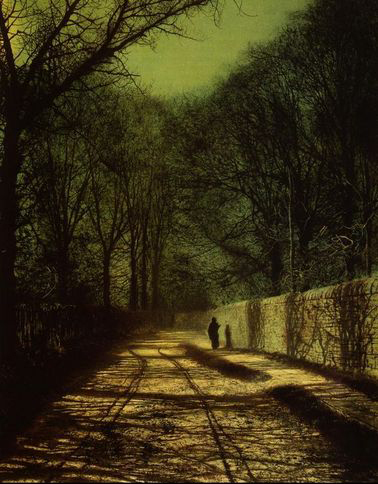 Fleet (Four Weddings and a Funeral, Vicar of Dibley, and I believe made for the role of Frederick Dorrit in BBC’s ‘Little Dorrit’) about the marvellous painter John Atkinson Grimshaw I have been prompted to take another look at Grimshaw’s beautifully atmospheric works. 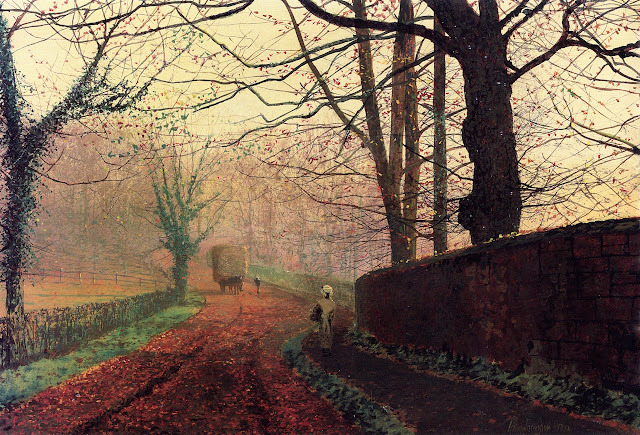 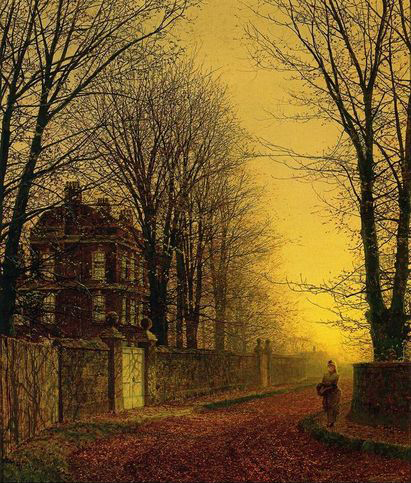 John Atkinson Grimshaw (1836 – 1893) was a Victorian painter known for his city scenes and landscapes. 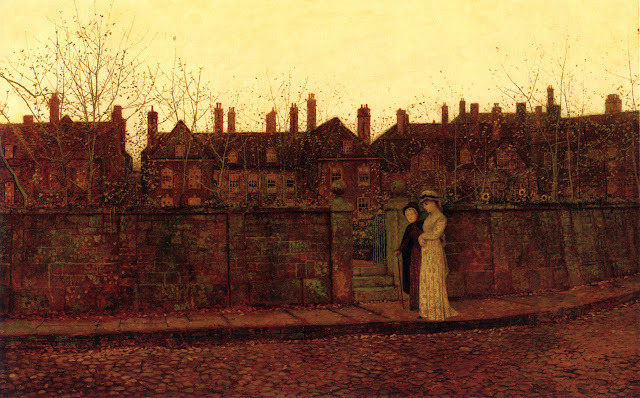 He was influenced by the Pre-Raphaelite movement initially but soon found his own ‘voice’, painting mainly urban scenes at twilight, dawn, and at night. He also indulged in some fashionable fairy paintings but personally I don’t think they’re among his best works. 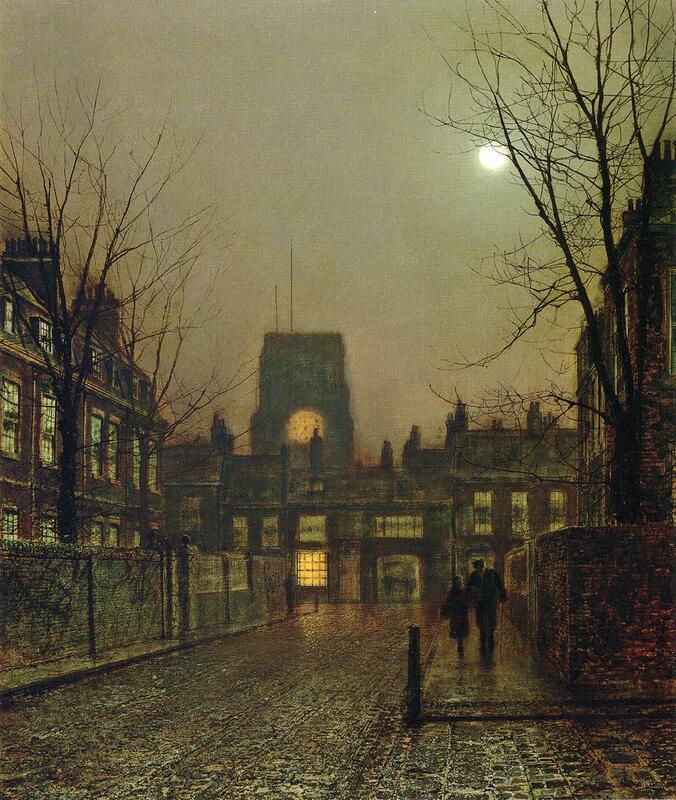 He was born 6 September 1836 in Leeds. 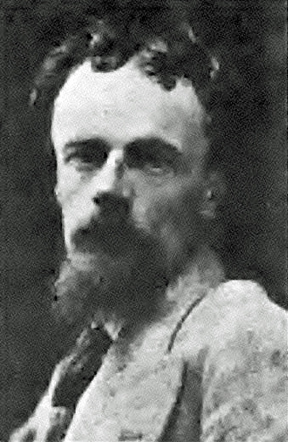 In 1856 he married his cousin Frances Hubbard (1835-1917). 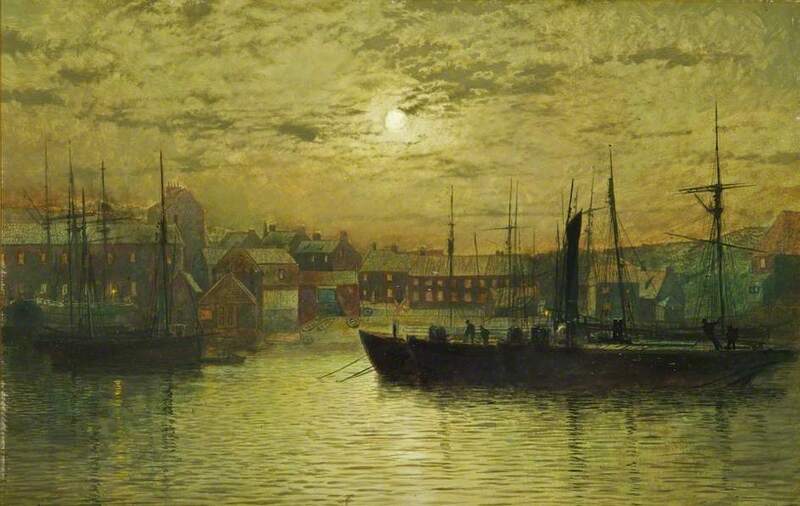 In 1861, at the age of 24, to the dismay of his parents, he departed from his first job as a clerk for the Great Northern Railway to pursue a career in art. 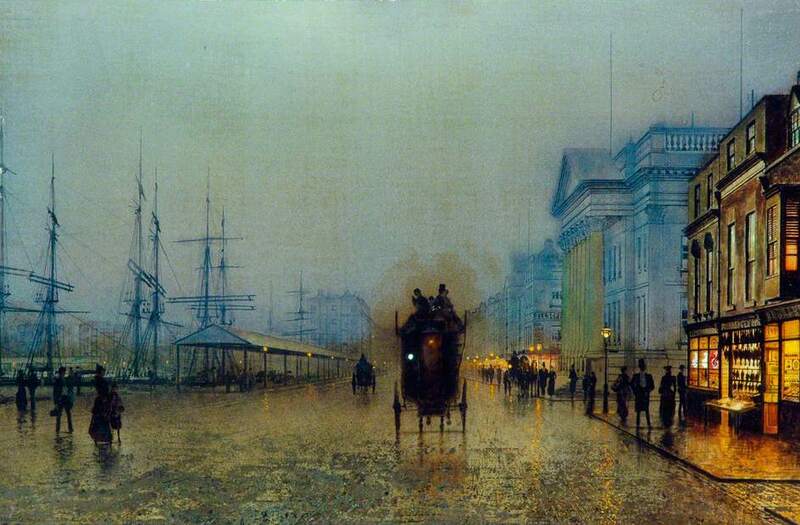 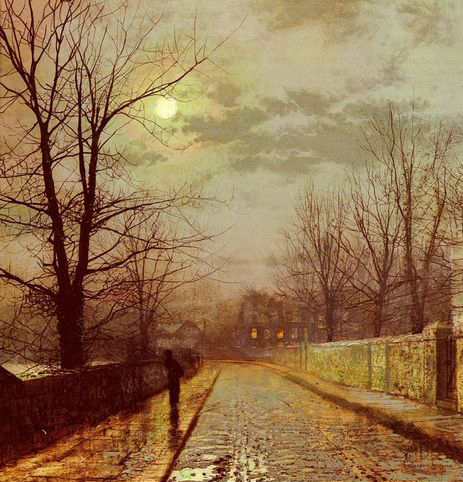 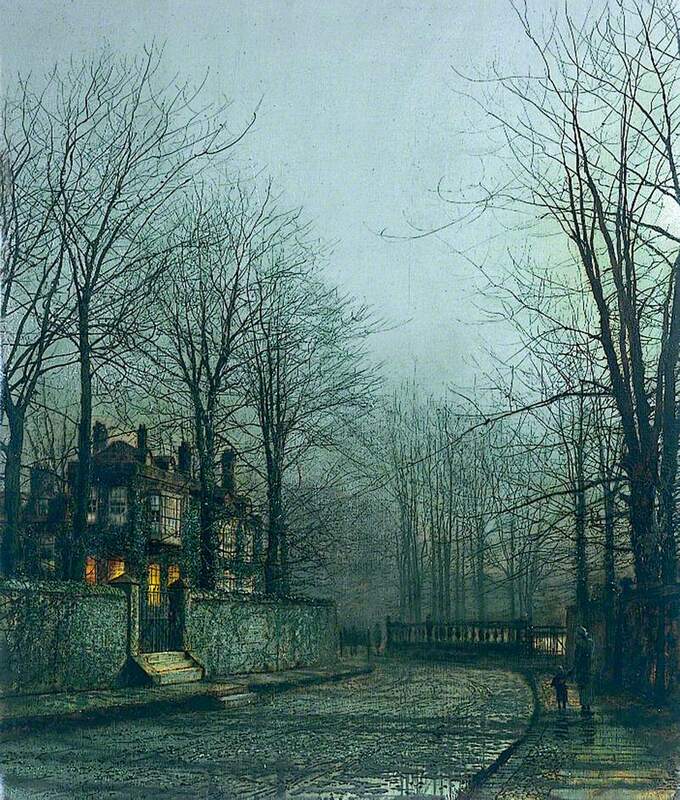 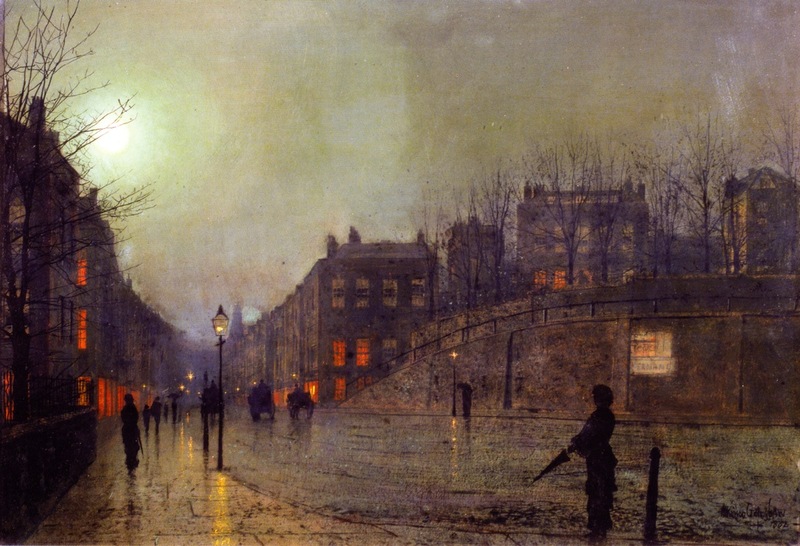 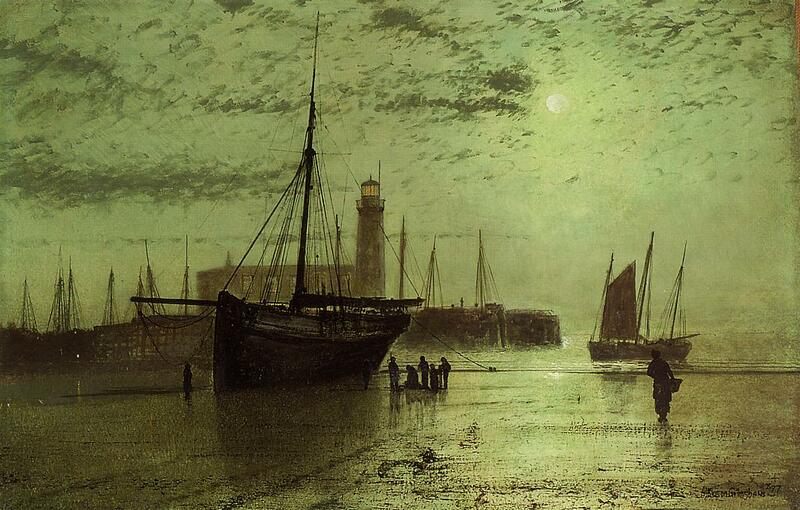 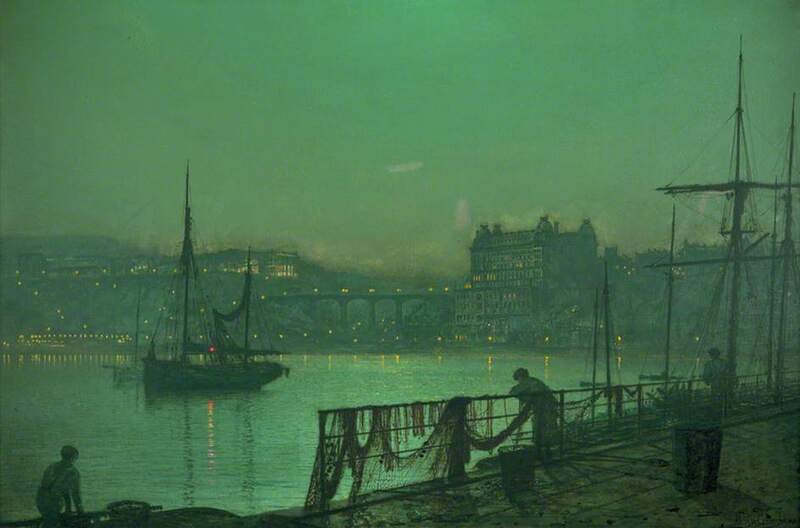 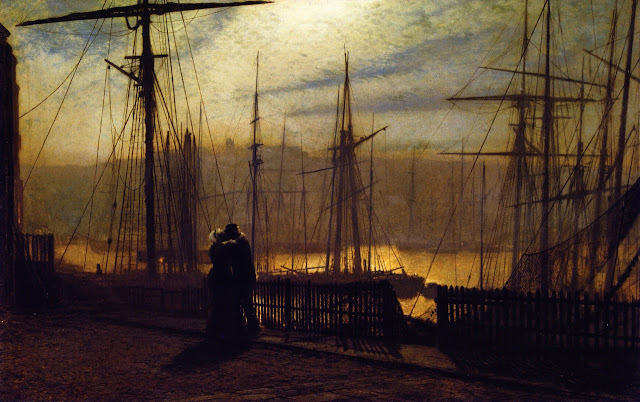 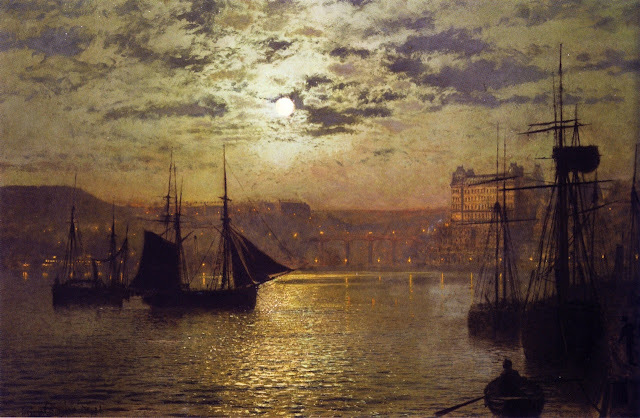 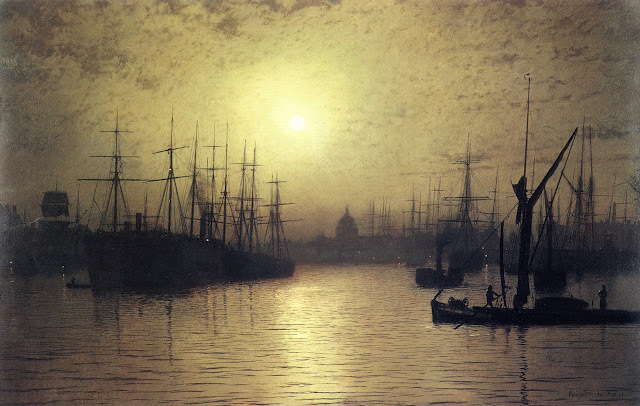 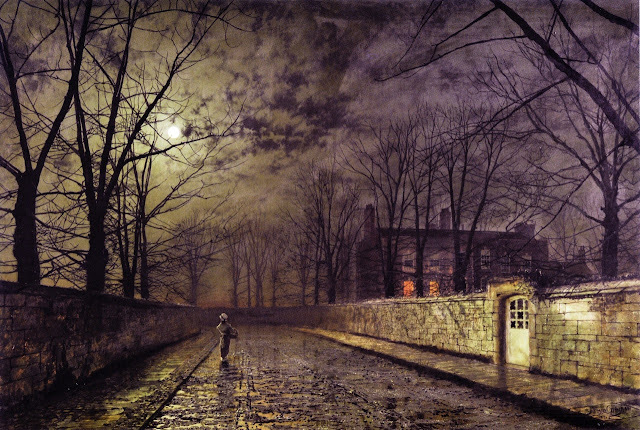 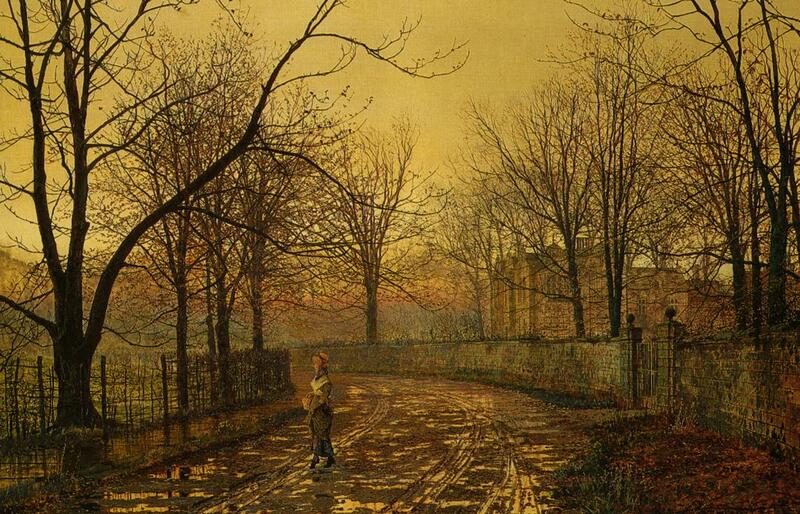 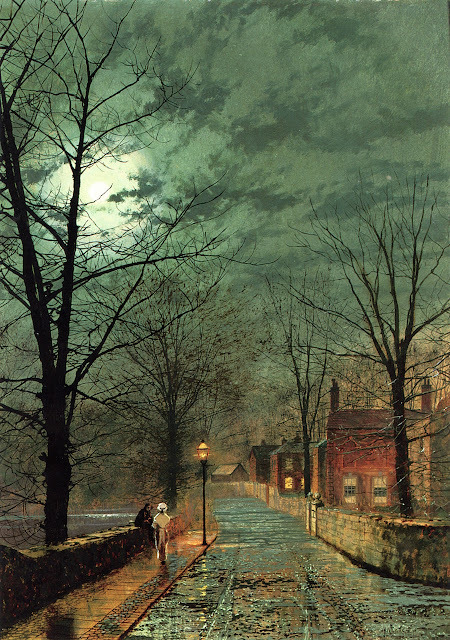 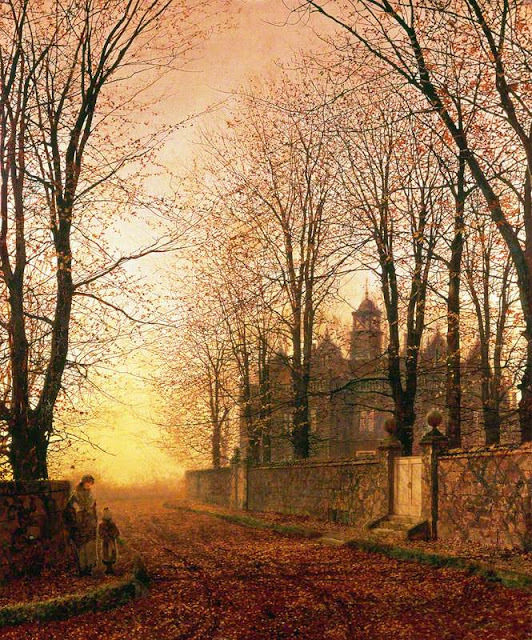 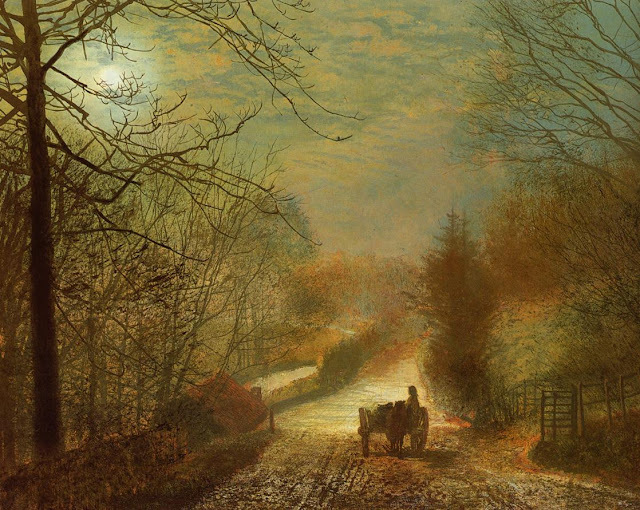 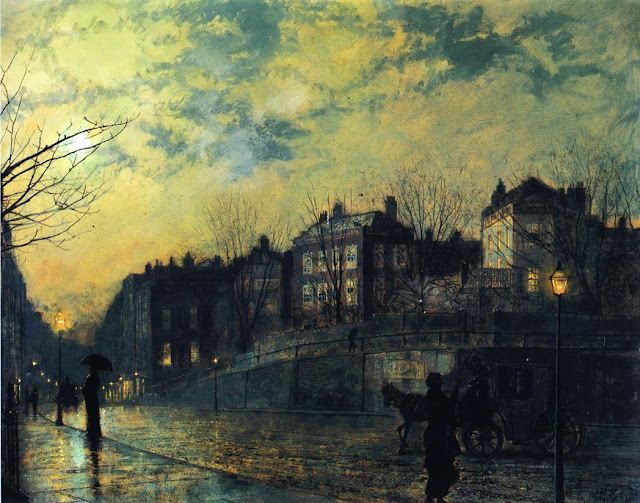 Grimshaw's paintings were sold in two art galleries, smaller picture dealers and a couple of bookshops in Leeds. 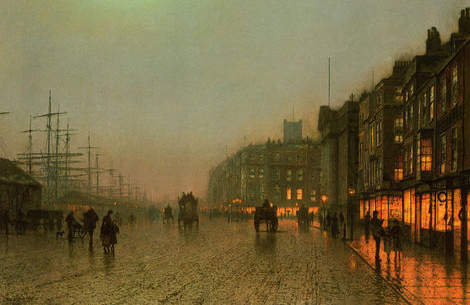 One of his main customers was Thomas Fenteman, who owned an antiquarian booksellers. 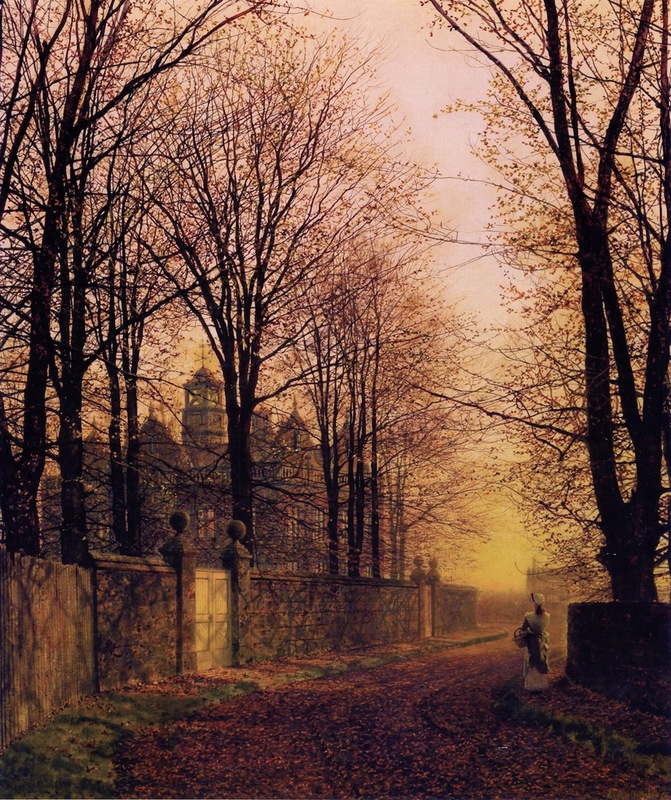 Fenteman was a deeply religious man and would only buy the pictures after Grimshaw had confirmed that they had not been painted on a Sunday. 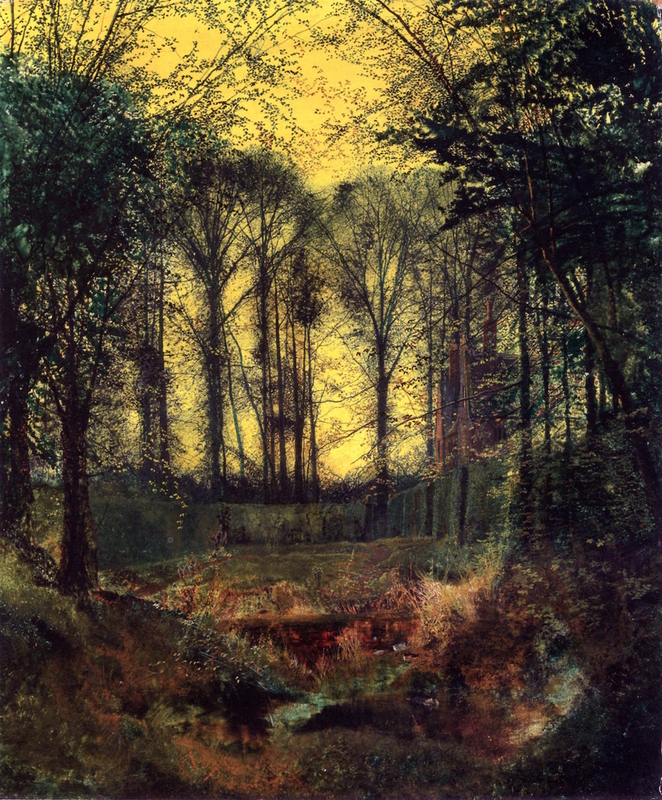 He began exhibiting in 1862, under the patronage of the Leeds Philosophical and Literary Society, with paintings mainly of birds, fruit, and blossoms. Grimshaw became a popular artist in Leeds and in 1865 he was able to move with his wife to a more expensive part of the city. 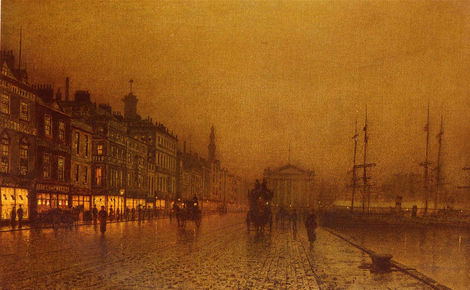 William Agnew, a London art dealer, began purchasing his work. 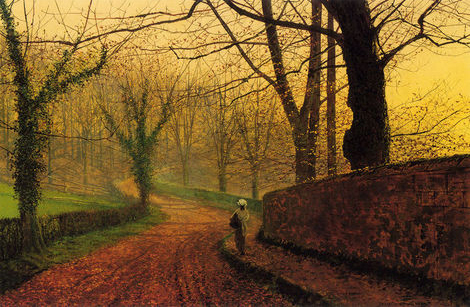 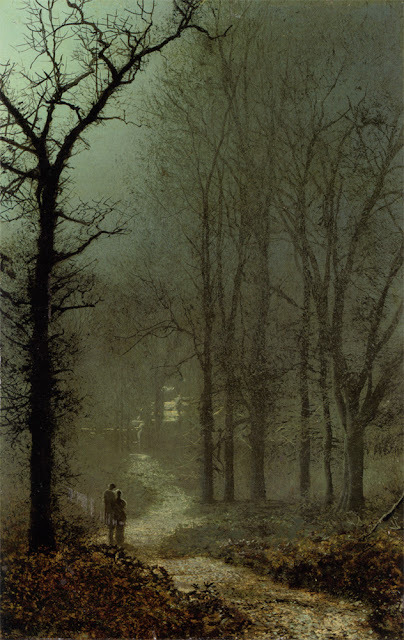 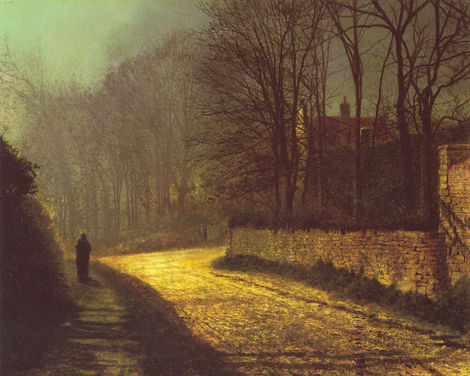 Further success came when a picture by Grimshaw was accepted by the Royal Academy. 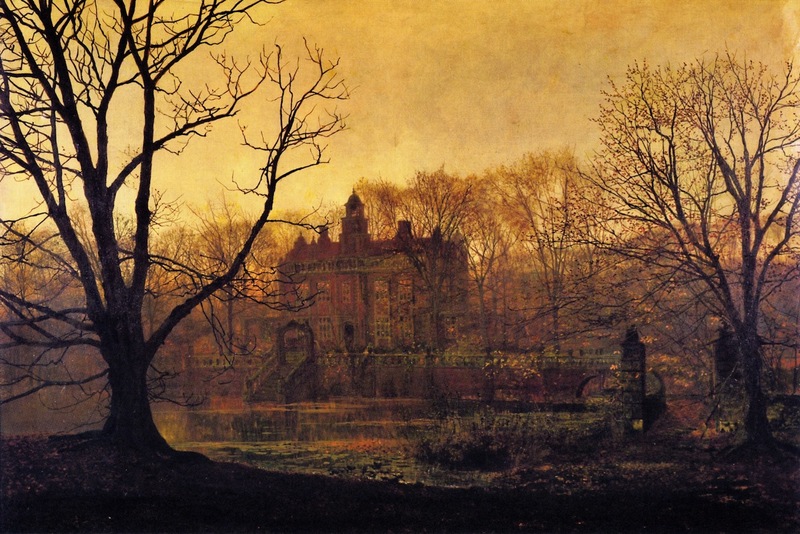 By 1870 Grimshaw was in a position to buy Knostrop Old Hall, a large seventeenth-century manor house, two miles from Leeds. 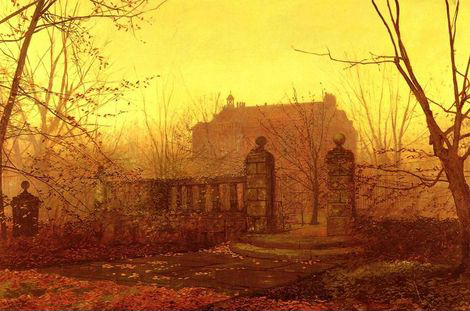 Fanny Grimshaw gave birth to fifteen children but only six reached adulthood. Several of his children, Arthur Grimshaw (1864-1913), Louis H Grimshaw (1870-1944), Wilfred Grimshaw (1871-1937) and Elaine Grimshaw (1877-1970), also became painters. 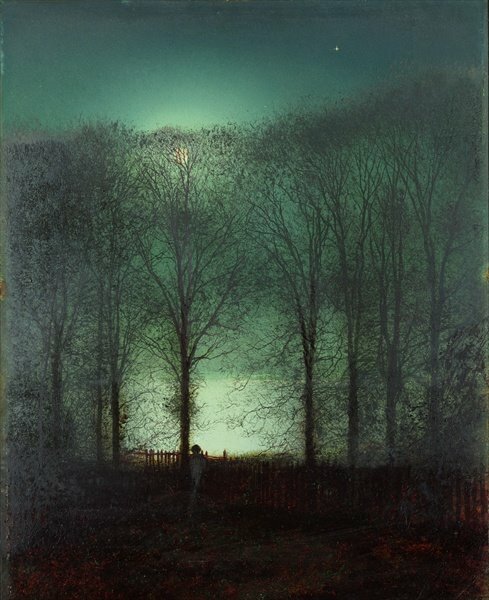 I have been searching tirelessly for the title of the eighth painting shown here, of what appears to be moonlight on a pond or lake during wintertime, with the moon itself partially shrouded by branches. Any help or a nudge in the right direction would be greatly appreciated. 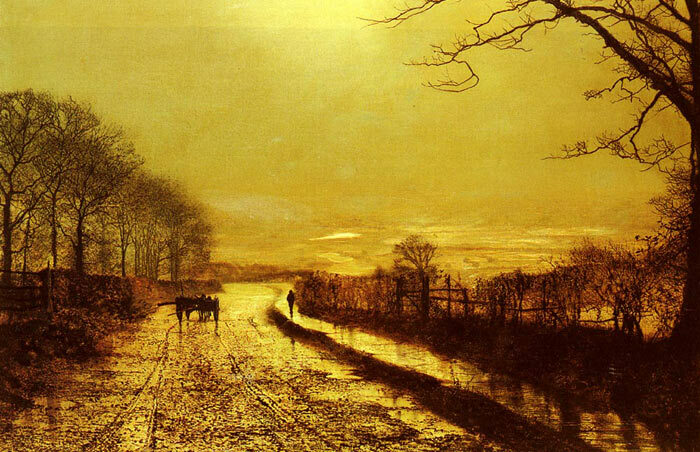 With gratitude.